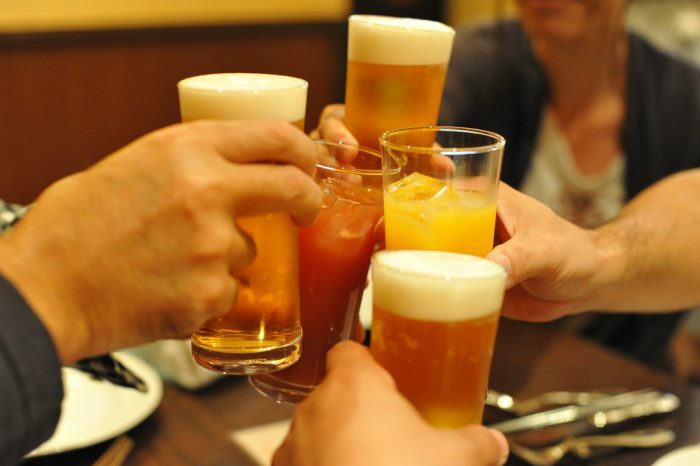 Nomihoudai (飲み放題) at restaurants and izakaya (Japanese style pub) means all-you-can-drink and it’s surprisingly common in Japan. Tabehoudai (食べ放題) means all-you-can-eat and many restaurants offer both. Each establishment has its own rules for their particular nomihoudai special, but most places do a flat fee for 90-120 minutes of unlimited alcoholic drinks; sometimes tabehoudai has no time limit, just what your stomach can handle. Essentially, nomihoudai and tabehoudai are set up for friends, family, couples, and co-workers to get together and let loose. The flat fee makes it such a stress free way to throw back a ton of drinks and eat great food without the worry of how much the check will be by night’s end. Check out the Nomihoudai Cheat Sheet for necessary Japanese phrases concerning nomihoudai. It contains audio you can play for your server or just to practice pronunciation. Here is a Restaurant Cheat Sheet that can make sure you have an easy and fun experience; also, with audio. Two excellent helpers for a night out in Japan! A popular chain restaurant named Nabezo has both nomihoudai and tabehoudai. Nabezo can be found all over Japan and it serves up the Japanese favorite “nabe”, which is a hot pot style meal. Many kinds of meat and vegetables boil in a broth that can be a specific flavor, as you drink and enjoy good company. Great for groups! Tokyo is flush with nomihoudai and tabehoudai places, below is a few that have amazing food. High quality food AND all-you-can-drink! On Friday and Saturday nights the effects of how many people enjoy going to such restaurants and izakaya is obvious. The usually quiet Tokyo subway cars get noisy with gleeful chatter and the streets are full of people singing, stumbling, and giggling. For the most part, it’s great fun. Just keep your eyes open if the night is late, cause it does bring out the weirdness in people on occasion. Very good Korean style grilled meat, unique look for the tables with grills. Delicious tonkatsu (fried pork cutlet) restaurant; perfect with beer or whiskey highballs. Pizza place with all-you-can-drink!!! Nothing more to say, pizza and nomihoudai is a beautiful marriage.